Village of Arlington Heights trustees on Monday February 20, 2017 granted preliminary approval (7-1) for a proposed $13.7 million building expansion at Windsor Elementary. For several years, Windsor Elementary School has operated with temporary classroom units. Lori Bein, superintendent for Arlington Heights School District 25, said the building expansion project was prompted by a sharp uptick in student enrollment. The proposal includes the construction of six new classrooms to the south of the existing building, and an expansion of the gym and common areas to the west of the existing building and on existing parking areas. New parking lot design and driveways will expand available spaces by 12, and will allow more vehicles to engage in drop-off and pick-up within the school property and off the streets. Windsor’s current enrollment is 509 students, according to Bein, who added that enrollment is expected to jump to 595 in the next five years. So far accommodation of expanding enrollment has been managed by creating three temporary classrooms, including two classroom trailers at the west side of the school and a third classroom setup inside the library. 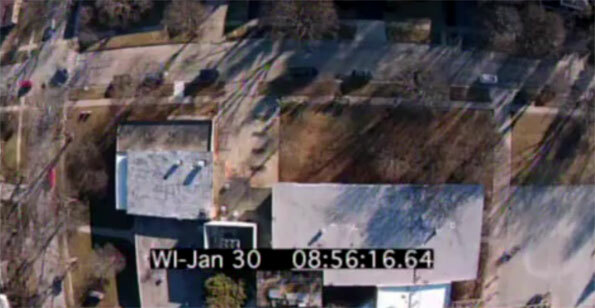 Still frame of aerial video showing Windsor Drive at 8:56 a.m. on January 30, 3027. Traffic flow, child safety, and neighborhood impact have become major concerns connected to the new design plans, but have also been an issue before the expansion plans. Since many residents, parents and officials remain concerned about significant traffic issues and student safety, proponents of discussion about the design and new construction uphold the opportunity for improvement in the traffic flow system integrated with the planning and design process for Windsor School. District 25 Director of Facilities Management Ryan Schulz presented results of studies and projections about the design of the Windsor project, enrollment and traffic flow. Current traffic impact on the neighborhood in the morning is about 11 minutes. Currently, traffic on Windsor is only permitted to go southbound in the morning near the school. Currently there is no afternoon northbound restriction. Under the new plan, northbound traffic would be restricted on Windsor in the morning and the afternoon. District 25 presented an aerial drone video to display traffic flow during the morning drop-off and afternoon pickup times. District 25 proposes new traffic flow that adds a segment in the parking lot on the west side of the school building. Trustee Jim Tinaglia asked whether the west parking lot could come further south into the school site, and whether the driveway could then exit on Windsor. Schulz replied that the considered traffic pattern would have actually entered on Windsor and exited on Miner Street so that students would enter and exit vehicles on the school building side of their vehicle. Also, Steve Corcoran with Eriksson Engineering said prohibiting a left turn onto Miner Street would perpetuate the traffic flow problem. Trustee Joe Farwell and Carol Blackwood applied the most scrutiny to the design integrity with traffic flow. “I like your expansion, but I don’t think it’s been significantly thought out yet,” Farwell said. He called the Windsor expansion a thoughtful expansion, but he referred to a District 25 memo that was sent to parents. Farwell said he had an issue with the fact that the memo stated that the village does not believe a formal Village Board Meeting is the best format to work out the details of potential modifications of the school drop-off and pick-up system. Farwell said he disagrees with that statement. First he said he didn’t remember the board discussing it. And second Farwell explained that if it was a statement made by the District 25 Administration and not the Village Board, it was a brash statement. Farwell said he believed the statement curtailed people from coming to the meeting that might have otherwise spoken. Trustee Joe Farwell explained that the upcoming meeting on the traffic safety issues as, “a horse and cart issue,” suggesting that District 25 officials should have vetted their drop-off, pick-up and street parking plans with parents and local neighbors before seeking a special use permit from the village. Farwell also recommended that an evening meeting be scheduled on the same day so that all parents are accommodated. He also recommended the RSVP requirement to attend the meeting be rescinded. Despite his criticism of District 25, Farwell was among the seven trustees who would vote in favor of the preliminary approval of a special use permit for the Windsor project. Windsor is one of seven elementary schools in District 25. Like many other schools in the school district, Windsor School has traffic system problems with hazardous traffic conditions and parents violating traffic rules. For example, at Thomas Middle School, parents park too close to corners near Thomas Street and Belmont Avenue, and parents stop or stand on eastbound Thomas Street where “No Stopping, Standing or Parking” signs are located. Trustee Michael Sidor also cited examples of parents ignoring similar signs on Highland Avenue at South Middle School. The Arlington Heights police have even sent out an alert recently that explained that police officers assigned to observe in school drop-off and pick-up activities have observed numerous unsafe practices. Trustee Carol Blackwood, who would cast the sole “no” vote Monday night, expressed concerns that the proposed building project does not include a definitive plan for traffic control, and student drop-off and pick-up times. She said her experience while volunteering at Windsor while parents were dropping students off in the morning revealed potentially unsafe conditions. Blackwood also said she discovered there wasn’t enough staff to assist with traffic before and after school. Bein said they considered hiring a person just to supervise the traffic system, but that they already have difficulty hiring crossing guards. Bein said District 25 plans to hold two community meetings to discuss student safety at drop-off and pick-up areas. The first meeting is scheduled for 9:45 a.m. March 2, 2017 at Arlington Heights Village Hall, 33 S. Arlington Heights Road. A second meeting was also scheduled for 7:00 p.m.
Only one parent spoke publicly on the blue card before the Village Board. Parent and PTA member Stephanie Williams emphasized that parents asked District 25 to be involved in the planning from the beginning, but no involvement took place. She said now is the time to make changes in the traffic system, or changes won’t occur. She remarked that the aerial videos did not show the difficulties that occur in snow conditions. Snow banks from plowing and general slippery conditions compound any problems with the traffic system at Windsor. Mayor Thomas Hayes liked the idea of deferring to a special meeting, saying the parents that are involved with the traffic issues are much more qualified to work toward resolution. Hayes said he has never experienced the drop-off and pick-up system, and therefore doesn’t feel qualified. Hayes said he wanted to rely on the people, who have experienced the traffic system, and the Village of Arlington Heights experts. Village Manager Randall Recklaus liked the idea of holding two community meetings about potential traffic issues at Windsor, but he acknowledged that the discussions are not likely to solve all of the problems surrounding student drop-off and pick-up, as well as traffic and parking concerns in the surrounding neighborhood. Following a presentation and discussion lasting over 80 minutes, the Arlington Heights Village Board voted 7-1 to grant preliminary approval of a special use permit. Construction at Windsor Elementary School is expected to begin this spring and conclude by the start of the 2017-18 school year. The Village of Arlington Heights and School District 25 are scheduling two meetings with parents and neighbors regarding school drop off and pick-up options at the soon to be expanded Windsor School. These meetings will be open to the public will involve roundtable discussions with Village, Police and Engineering staff as well as staff from District 25 about options for improving safety and traffic flow at Windsor School. The second meeting is scheduled for March 2nd at 7pm, also in the Community Room of Village Hall. Staff from District 25 and the Village will continue to work with stakeholders on Windsor drop-off and pick-up issues both at and after the meetings, with whatever follow-up communications are necessary. The meeting is open to anyone from the public who is interested, but we would ask that residents RSVP by calling or emailing Kathi Deasey at [email protected] or (847) 368-5101 so that we can manage meeting space efficiently. The Village and District 25 both believe that the safety of our children is our highest priority and are committed to working together to improve pedestrian safety around schools whenever possible.